What a great game last night. We invited a few friends over, made a huge pot of chili (thanks Jamie Oliver - great recipe), a chickpea salad (thanks again Jamie) for the lone vegetarian, lots of good wine (3 guests work in the industry) and these great cupcakes. The lone vegetarian brought her two young girls and knowing they would have no interest in rugby I gave them the task of decorating the banana and Nutella cupcakes (thanks Delicious Days ) I had made earlier. Next Saturday night Bryan and I will watch the game from the North Eastern stand at Eden Park. My very first live Rugby game. My dilemma is should I wear black or yellow? Max Schubert - You're the Best. It was worth the wait. ....and it was good. So good in fact we sat for 15 minutes with our nose in our glass enjoying the aroma. There was coffee, liquorice, plum,cassis, flint and even a faint hint of eucalyptus. The colour was intense - a ruby red still showing plenty of blue tinge. On the palate it was well balanced, soft tannins, complex and a looooong finish. Two days later and I can still taste it. While Peter put the finishing touches to the Osso Buco, we chatted over a glass of Riesling. I was relieved I wasn't the one required to come up with the menu. Peter and Linda decided on the Osso Buco with polenta and green beans and it was a great match. There was an entrée and a dessert and Lynda's signature dish of ginger and almond cake, coffee and Lindt chocolates, pinot noir and Sauternes - and everything was fabulous -but all I really remember about the evening was The Grange. Grange was conceived by Max Schubert when he was the winemaker at Penfolds back in 1950 . Wine Spectator magazine named the 1990 Grange "The Best Red Wine in the World". Read the official winemaker notes here . We could have waited another 6 or 7 years to open the Grange and I still think it would have been as good as it was on Saturday night. I have worked out it will cost around what I usually spend on wine every 6-8 weeks to purchase another bottle of the 1990 vintage. Tonight we drink the Grange. This morning I removed the bottle from its cradle on the bottom shelf of our cellar where it has waited quietly for this day. After 6 or 7 years there it is suitably covered in a layer of dust. It would no longer be needing the little note it has worn around its neck all these years. The little note reading DO NOT TOUCH. I confess there have been days where I have been in the cellar and touched the bottle of Grange. I would carefully take the Grange out of its bed and hold it lovingly, imagining the day we would carefully remove the cork and pour this great juice into our glasses. I can't remember the exact year we won the Grange - 98 0r 99. It was the top prize in a Wine Options competition at the Auckland Club. We came away with several of the wines that evening after we won 5 out of the 6 rounds. I don't wish to boast - but - back then we won the Wine Options two years in a row. Around seven this evening we will drive over to the home of our team mates from the evening, Peter and Linda, where they will have prepared a feast fit to accompany this great wine. Please Lord, don't let it be corked. Our back up wine is no where near as exciting. Lenn has written his round up of the 43 or is that 45 entries in the latest Wine Blogging Wednesday. Check it out here . Who would have thought - they make wine in Tennessee. With the theme drink local we get to hear about many US wines but Australia, France and Spain also get a mention. Clare over at The Food Palate has posted a wrap of the Australian food and wine blog July postings. She has been kind enough to include New Zealand. Check out her post Omnivoribus Australia. Check out this brilliant piece of writing from Alder at Vinography. While Jam faced is eating strawberries and World on a Plate pink peaches, down under we are finding ways to keep warm. And there is nothing like hot chocolate to keep us warm while we keep on eye on the cricket and watch the Bledisloe clash on Saturday. I won't tell you how to make a cup of hot chocolate as I'm sure you know how. All you need to know about chocolate can be found here though. 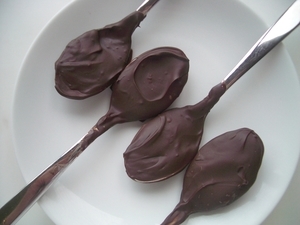 My special hot chocolate tip: melt some dark chocolate and roll a teaspoon in the melted chocolate and leave to set. Make your own special hot chocolate recipe and place the chocolate covered spoon into the mug and serve. Stir and lick as you feel the need. Sorry Lenn I've cheated a little with this months Wine Blogging Wednesday. On the anniversary of this great event, I'm hoping our founder and host Lenn will forgive me. Our mission was to drink local....and I did....but I went back in time a little to do so. From my home in Takapuna I could have gone west to Henderson - but most cellar doors there grow their grapes elsewhere. Or maybe south to Clevedon , across the water to Waiheke or possibly the nearest of all - north to Matakana. But I decided to step back in time and drink locally from where I used to live. Where I grew up actually - Margaret River . This is not just any wine from any vineyard. This is wine from the Wine Company that bought our family farm and turned it into a vineyard. The grapes in this bottle, aren't actually from the old farm that is now the vineyard. These grapes are from further down the road, but still near enough to be considered local. Details: From the Winemaker (for the 2001 vintage). Colour: Red, with a brick colour around the edges. Legs: Long enough for me. Nose: Savoury, earthy and a hint of chocolate. Taste: Soft tannins, a hint of cassis, chocolate on the finish. Verdict: Oh dear, I should have bought more back on that 2001 visit. Trivia: My father named our farm (as you do in Australia), Jindawarrabelle. 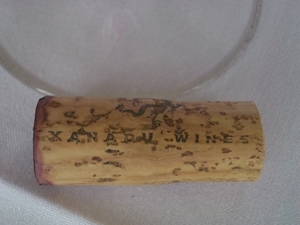 Xanadu have retained the name Jindawarra for a range of their wines. Go here to read what they have done with the property this year. "A spoonful of a new "anti-wrinkle jam" with their morning coffee and croissant has been hailed by French women as a secret weapon for youthful-looking skin." From Noreva in Provence comes this product called Norélift. Read the Sydney Morning Herald article here. It is available in three flavours: Green tomato and green tea, Melon and grape, Blueberry and blackcurrant. Intersting concept, don't you think? I took advantage of yesterdays special preview day with limited tickets available. Well worth paying twice the normal entry price - no crowds, no children and I only saw two prams. My only complaint I missed out on Kylie Kwong who is on this weekend. The Aussie surfing chefs Ben and Curtis demonstrated some tasty looking seafood. The Devonshire Tea is the English version of the Japanese Tea Ceremony. You will find them served all through England and as a result of colonisation, many Commonwealth countries. It seems every little coffee shop or café in a tourist area throughout New Zealand and Australia will have their own version of the Devonshire Tea. 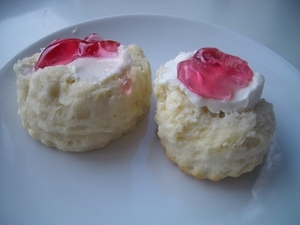 A traditional Devonshire Tea consists of scones served with clotted cream and jams. My Devonshire Tea is a little more calorie friendly but just as tasty. Some months ago Judy posted this scone recipe on the forums of Chocolate and Zucchini . I adapted her recipe to reduce the calories a little by replacing the can of lemonade (Sprite, 7Up) with soda water. Next time I will test the recipe with a low fat cream. Preheat oven to 230 degrees. Add cream and soda water and mix. Lightly knead and roll out to 3 cm thickness. 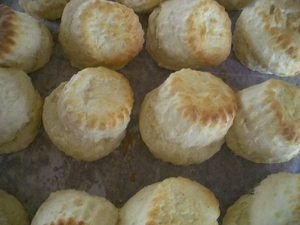 Cut with scone cutter, place on greased tray or tray lined with baking paper. Bake 10 minutes in 230 degree oven. Line a sieve with muslin and place over a bowl. Pour 1 kg container of unsweetened low fat yogurt into sieve and leave to drain in fridge overnight. Gather up corners of muslin and squeeze gently to create a round shape. Place in dish to serve. All utensils must be spotlessly clean. Heat milk to between 20 -25 degrees, stir in yogurt and place in container in a warm spot and leave overnight. Place a sieve over a bowl, line sieve with several thicknesses of clean muslin, tip yogurt mixture in, place in fridge and leave to drain. This method can be difficult as the setting is effected by room temperature. Split scones in half, top with yogurt spread and a teaspoon of jam. TASTE OF YELLOW ROUND UP 2008 Part 2.